Make no mistake; you must be a certain type of woman that can pull off these designs. She should possess moxie, good taste and a strong sense of chutzpah. This collection embodies the essence of "BADASSNESS". Is there anything wrong with wearing a collection that allows a woman to be a figure of noteworthy badassery? From the Al Capone wool fedora to the lavish fox fur accessorizing certain pieces, Stevie Wonder could see the color, the cut of the design, the luminosity of the fabric, and the beautiful women wearing it. 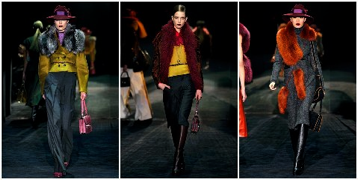 Gucci is recognized as a designer that has always pushed the envelope with color and extravagance, but I adore this color palette. There is a uniform pattern, or just a plain audaciousness that screams "BAM"!! It is understood that anyone remotely feeling the role of a lackey or servitude will open the door graciously for the diva romancing this collection. 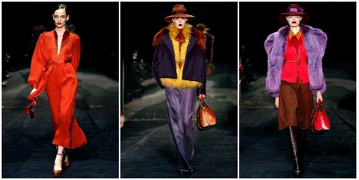 The androgyny of this collection is quite reminiscent of the days of Capone and prohibition, but instead of these mobsters carrying a Tommy Gun or a case of watered down bourbon, they carry a matching bag with color that blends perfectly with their tailored outfit. One could easily be thrust back during an era when Sulka, the men's haberdashery, dressed all of the great prominent male icons, even the Goodfellas of that time period. Gucci's distinctive lines and Tom Ford maintaining a sense of this company's history of Florence luxury shall always prevail...molto bella.